Such visits raise questions about whether patronizing Trump's private business is viewed as a way to influence public policy, critics said. WASHINGTON – Last April, telecom giant T-Mobile announced a megadeal: a $26 billion merger with rival Sprint, which would more than double T-Mobile’s value and give it a huge new chunk of the cellphone market. The next day, in Washington, staffers at the Trump International Hotel were handed a list of incoming “VIP Arrivals.” That day’s list included nine of T-Mobile’s top executives – including its chief operating officer, chief technology officer, chief strategy officer, chief financial officer and its outspoken celebrity chief executive, John Legere. The executives had scheduled stays of up to three days. But it was not their last visit. Instead, T-Mobile executives have returned to President Donald Trump’s hotel repeatedly since then, according to eyewitnesses and hotel documents obtained by The Washington Post. Countries, interest groups and companies like T-Mobile – whose future will be shaped by the administration’s choices – are free to stop at both, and to pay the president’s company while also meeting with officials in his government. Such visits raise questions about whether patronizing Trump’s private business is viewed as a way to influence public policy, critics said. After The Post published a version of this article online Wednesday, a Democratic member of the Federal Communications Commission – which would have to approve the merger – tweeted about her concern. “This does not look good,” Commissioner Jessica Rosenworcel wrote, making note of the report. The potential conflict of interest posed by Trump’s dual roles in Washington was underscored in a separate development Wednesday, when the General Services Administration’s internal watchdog issued a scathing report of the agency’s decision-making that allowed the president to keep his lease for the hotel, which is in a federally owned building. 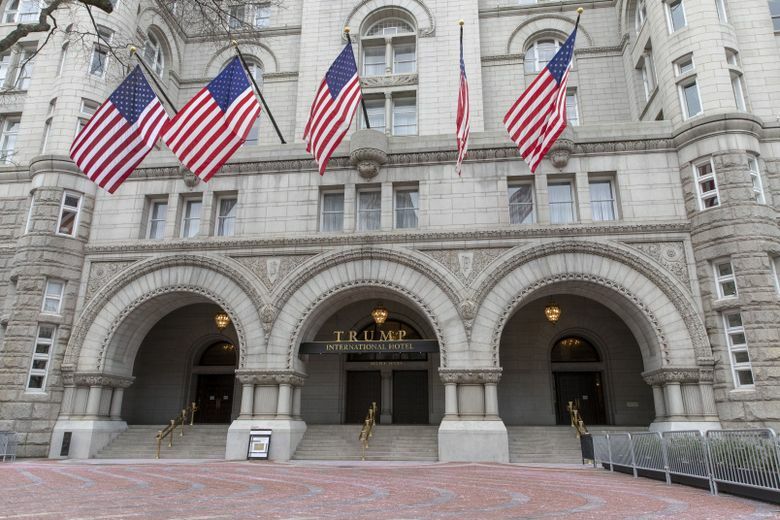 It said the agency should have assessed whether the lease violates the Constitution’s emoluments clauses, which bar presidents from taking payments from foreign governments and U.S. states. But it “improperly ignored” those concerns, the report said. The VIP Arrivals lists obtained by The Post – in which Trump hotel executives alerted their staff to foreign officials, corporate executives, long-term guests, Trump family friends and big spenders – provide an inside look at some of the hotel’s customers. The Post obtained lists for about a dozen days in 2018. The Post shared details about those stays – gleaned from the VIP Arrivals lists and eyewitness accounts – with both T-Mobile and the Trump Organization. Neither challenged the findings. After Legere’s brief interview at the Trump hotel, T-Mobile declined to comment further for this report. Before last year, Washington had been a place of disappointment for T-Mobile, which is the third-biggest of the United States’ four big cellphone providers, which has long sought a merger to grow bigger. In 2011 and in 2014, the Bellevue, Washington-based company planned to combine with rivals: first AT&T, then Sprint. But both times, the Obama administration rejected the mergers on antitrust grounds, saying they would decrease competition and hurt consumers. The deal would require approval from agencies including the Justice Department, which handles antitrust enforcement, and the Federal Communications Commission, which regulates the airwaves that cellphones use. Those two agencies declined to comment. Sprint, the market’s fourth-place player, is largely owned by SoftBank, a Japanese company whose founder, Masayoshi Son, has built his own relationship with Donald Trump. After Trump’s election, Son was praised by the incoming president for a promise to invest $50 billion and create 50,000 jobs in the United States. Sprint declined to comment for this report. Later, Legere mocked Trump’s hotels after checking out. “I am so happy to wake up in a hotel where every single item isn’t labeled ‘Trump,’ ” he wrote, according to news coverage. Those tweets appear to have been deleted. Three years later, on the day after the Sprint merger was announced, Legere was scheduled to arrive at the Trump hotel in Washington. That day’s VIP Arrivals list had 39 names. There were executives at a Defense Department contractor called AxleTech; a spokesman said they chose the hotel because they had a meeting at a corporate office across the street. Two other VIPs were connected with the pro-Trump super PAC America First Action, which was hosting a dinner with the president at the hotel that night. A spokeswoman said one room was for the event photographer, the other for staff preparations. And there were the nine T-Mobile executives. Of them, only Legere was listed with an “R” next to his name – signaling to Trump hotel employees that he was a repeat Trump customer. “Everybody knew. You couldn’t miss it,” said Jake Loft, who was in the lobby for a regularly scheduled networking event. 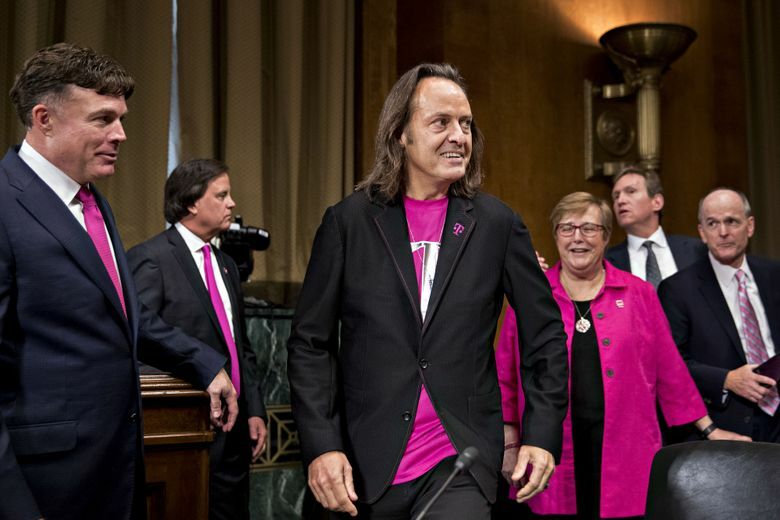 He spotted Legere by his outfit, which was – as usual – a walking billboard for T-Mobile. Legere wore a black-and-magenta hoodie with a T-Mobile logo over a bright-magenta T-shirt with another T-Mobile logo. “He wasn’t dressed appropriately,” Loft said. Tim Briseno, who was there with Loft, said that “it was essentially like a track suit.” Briseno remembered Legere giving out business cards, with an offer of a discount. “He was like, ‘If you guys switch, you’ll get 40 percent off for the rest of your life.’ ” T-Mobile did not respond to a query asking whether that offer was legitimate. On that first visit, some of the T-Mobile executives were expected to stay between one and three days apiece, according to the VIP Arrivals list. In late May, the Trump hotel expected T-Mobile’s general counsel, David Miller, for a return visit, staying two days. Then, on June 17, the VIP Arrivals list showed that Legere, Miller and T-Mobile Executive Vice President David Carey would be returning for five-day stays. That – according to Trump hotel staffers, who spoke on the condition of anonymity because they aren’t permitted to speak to the media – was an indication that Carey was making his 10th visit to the hotel. The listings also contained the words “Long Term” because of the length of their stays. Carey and Miller did not respond to requests for comment. Since Trump was elected, his hotel has been patronized by other groups with lobbying interests in Washington: foreign embassies, industry associations, religious groups. Lobbyists working for the Saudi government – a close U.S. ally that has grown closer under Trump – paid for 500 hotel rooms in the first four months after Trump was elected. “I can’t believe this is a coincidence. In mergers, companies look for any potential advantage they can find,” said Gene Kimmelman, who was chief counsel at the Justice Department’s antitrust division under President Barack Obama. He now leads the government-watchdog group Public Knowledge. Analysts say Legere’s own T-Mobile shares are valued at $16.5 million, a fortune that would probably grow if the merger is approved. Sometime after that interview, Legere apparently checked out of the Trump hotel. By the next evening, Legere was tweeting about the great bar at “my current DC hotel” – the Four Seasons in Georgetown.